Being one of the top rated tourist destinations in the country, Hyderabad has something that attracts every traveler from all corners of the world. It is the capital of the state of Telangana with an estimated population of 6.81 million inhabitants. 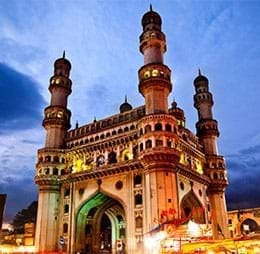 Located on the southern part of Telangana, Hyderabad has some of the best landmarks like Golkonda, Charminar, Hussain Sagar, Salar Jung Museum and Ramoji Film City. Hyderabad is a perfect destination for shopping lovers, where you can find various high end shopping centers and malls showcasing wide array of local and International brands. The city of smiles is home for numerous shopping malls and some old world charm locations like the Charminar, General Bazar, Begum Bazar, Shilparamam, etc. Hyderabad cuisine has prominent place in every foodies list for its mix combination of Mughalai and Persian influence along with a traditional Andhra and Telangana cuisines. Hyderabad has more than 400-year's old culinary history that blends with unique spices and exceptional flavors. Restaurants like Paradise & Bawarchi are world famous for their Biriyani. Being the striking capital, Hyderabad bas become a primary hub for vibrant nightlife. There are numerous places to hangout and shake your legs during night. The nightlife of Hyderabad has numerous pubs, theaters, live music and clubs to keep the crowd engaged. Checkout places like Trinity, Over the Moon, Club Republic, Hard Rock Café, and Cocktails Lounge. Telangana Capital, Hyderabad has one of the largest transportation networks in the country. The city is well connected by road, rail and other transportation modes to move from one point to another point. Radio cabs and taxi services are available 24/7 at an affordable cost. Rajiv Gandhi International Airport is the major airport in Hyderabad that serves domestic and international flights to all major cities across the world. Located about 20 km south of Hyderabad, this airport is considered as sixth busiest international airport in the country in terms of international visitors. The airport is a main hub for Air India Regional, SpiceJet, Blue Dart Aviation, Lufthansa Cargo and Trujet. The airport has one terminal, Terminal 1. This terminal is used for domestic and international operations. It has capacity to handle more than 12 million visitors every year. Hyderabad Airport is well equipped with 46 immigration counters and 96 check-in desks with 19 kiosks for self check-in. Rajiv Gandhi International Airport is well connected by airport shuttle, bus, cab services and taxis to reach the city center. Visitors can get a prepaid taxi outside airport arrivals at an affordable price to get into the city.